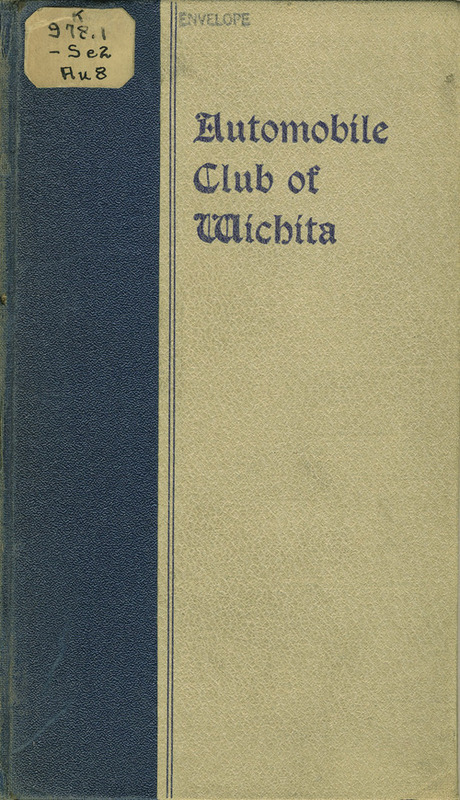 The Automobile Club of Wichita published this year book for the years 1909-1910. Its content reflects that automobile travel was a recent introduction to the lives of Kansans. It includes advertisements from automobile dealers, garages, and other businesses in Wichita, Hutchinson, Newton, Winfield, El Dorado, Dodge City, Yates Center, Iola, Independence, Topeka, Emporia, Garden City, and Lawrence. It also lists the officers and board of directors of the club, its constitution and bylaws, the Kansas law regulation the use of automobiles, two Wichita ordinances (#2875 and 3002) related to the use of cars, and rules of the road. The bulk of the yearbook provides driving routes to and from various cities and towns in Kansas, as well as Colorado and Oklahoma. An index to the routes and maps is on pages 22-23. These driving routes include specific directions and include references to many small towns and local landmarks, etc. The yearbook also lists Wichita residents that own automobiles, their license numbers and the type of automobile they own. The booklet concludes with a list of members of the automobile club.